Frozen biologically grown sea buckthorn berries – collected on the farm, thoroughly cleaned and frozen, grown under the Zemgale sun and with the power of its soil. LV-BIO-01 (A class). 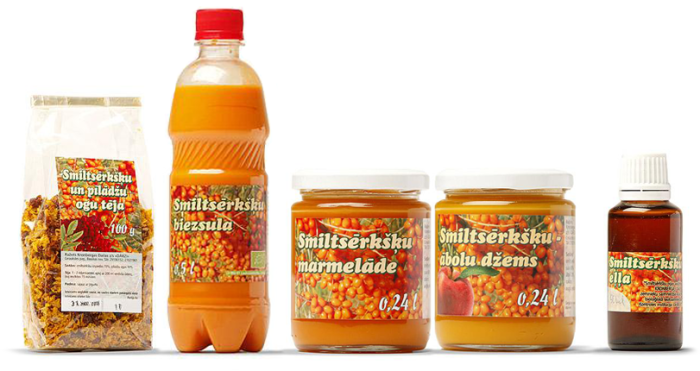 Sea buckthorn juice – cold pressed from our very best berries. Freshly pasteurised. The true elixir of youth. Available in a 0.33 l glass bottle or 3, 5, 10 or 20 l bag-in-box. Available in 3, 5, 10 and 20 l bag-in-box packages. Always fresh and delicious 100% natural juices. Including 30 days after opening. The best ingredient for making summer cocktails and drinks. Jams – a real delicacy made from our pulp. We recommend enjoying them together with meat or fish dishes. Try them with various cheeses. Enjoy them together with tea, on bread or with pancakes. Use in the preparation of cakes and cupcakes. All jams contain sea buckthorn juice, berry or fruit, sugar and fruit pectin. Available in 280 g and 125 g glass jars. Syrups – a healthy condiment to go with tea, ice cream, cocktails and sauces. Contains pulp and sugar only. In 0.5 l plastic bottles. Sea buckthorn candies – a most delicious treat and a great gift. We only produce them for Christmas. Sea buckthorn tea – a source of strength and vitality. Carefully selected sea buckthorn leaves and berries, dried at a temperature of 40 degrees. Sea buckthorn oil – for beauty and healthy. Rejuvenates and softens skin and heals abrasions. Honey pot – a healthy delicacy made from sea buckthorn berries, honey and sea buckthorn oil. Can be taken to the sauna to be rubbed into your skin. Available in a 125 g glass jar.